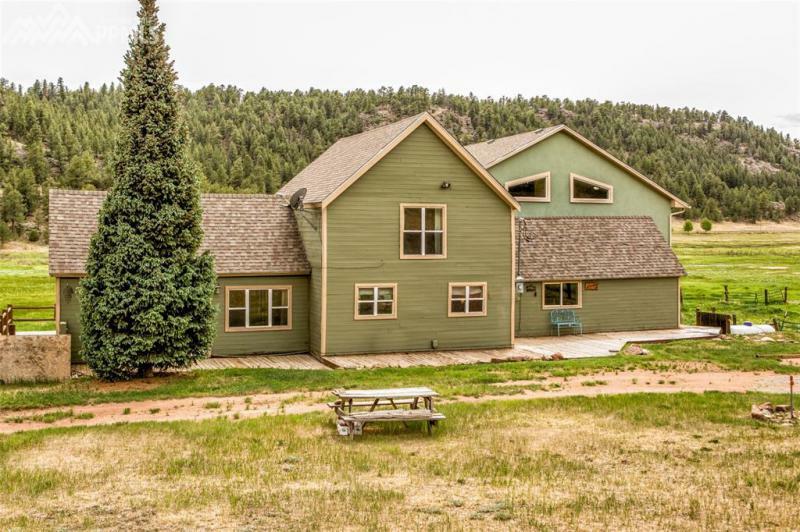 IN AS IS CONDITION A River Runs Through it on this Breathtaking Setting of 13+ acres with A historical home, locally known as the Old 76 Ranch. The original home of 1890 has been remodeled and 1560 square feet added to the home you see today. Enjoy the spacious master suite remodeled in 2014, and the very homey ranch style setting and style of this Stucco and Wood Sided home with 3-car / RV garage. Outbuildings with a 40 x 60 metal barn, 560 SF storage building and horse shed with stalls. Domestic well and sub-irrigated year-around-hay field produces 400-700 bales annually!!! Elk, deer, and bighorn sheep migrate through the property, adjacent Open Space that borders BLM land. You'll have exclusive fishing along Four Mile Creek and for miles into BLM land! The year-around underground spring flows into the tank for constant watering of livestock. Circular drive; covered deck, corral panel round pen. Home has Hail Resistant Roof installed 2013. Seller confirms there is deferred maintenance on decks and interior flooring, PREVIOUS INSPECTION INDICATES OTHER REPAIRS NEEDED.